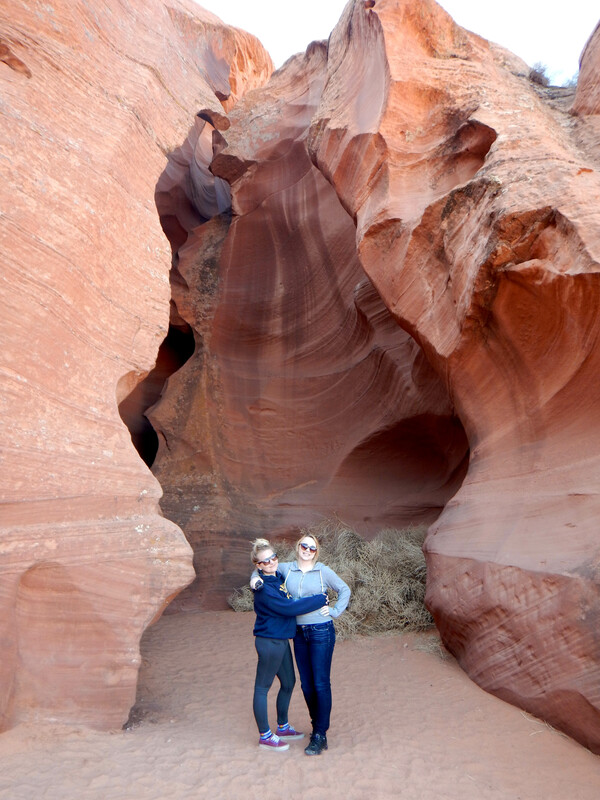 It was well worth going over a hundred miles out of our way on our Spring Break road trip to stay one night in Page, Arizona and tour the Navajo’s Antelope Canyon. 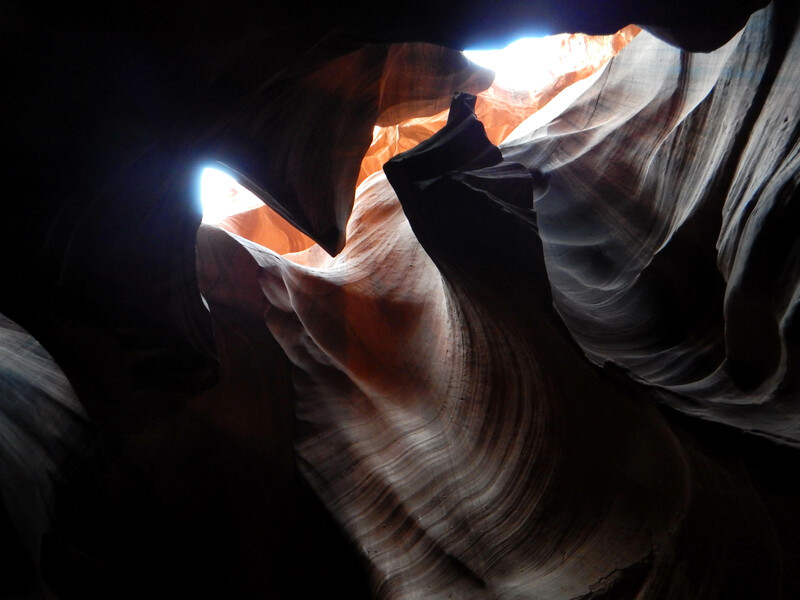 Living in canyon country and near Utah, we’ve hiked through many slot canyons, but what I saw and read online about Antelope Canyon made me want to visit. We arrived at the tour office in downtown Page at 7:30 a.m. and were loaded into the back of a pickup just before 8:00. There were two long bench seats, back to back, in the bed of the truck. Those sitting on the end were actually hanging out past the bed, perhaps even past the tailgate. A metal gate and seatbelts that double- and triple-buckled us made the 15 of us feel somewhat secure. We drove through town in this fashion, then north at highway speed, and, finally, down a wide, sandy wash. I’m guessing we were going about 70 mph as we glided through the sand toward the west. 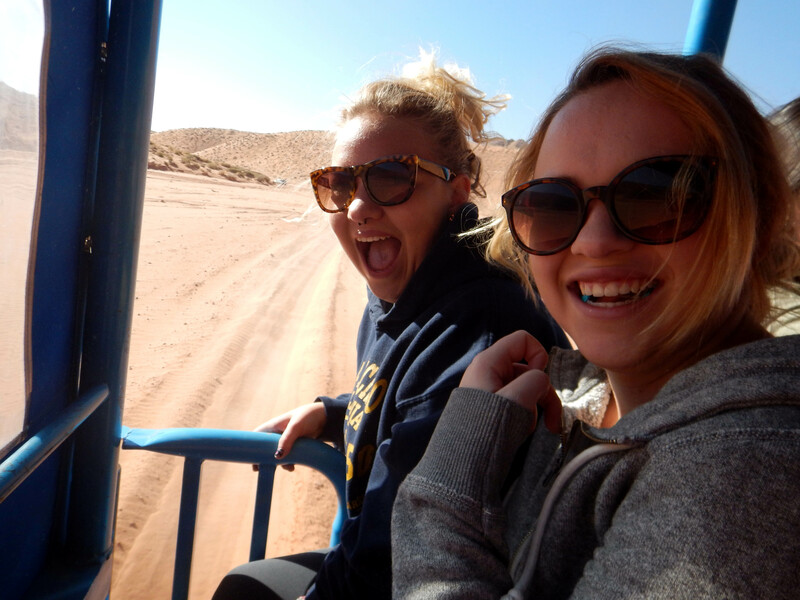 The driver would have to go fast to not get stuck in the foot-deep sand; there were no obstacles, nothing to run into; and, the guide later said he did seven of these tours per day so he had a strict schedule to adhere to. We traveled—again I’m guessing—about five miles down the wash. Needless to say, it was a separate highlight of the tour in and of itself as we leaned and laughed and realized we may never do anything like this again. Suddenly, the wash ended, blocked by a tall rock wall. And in the rock wall, a crack, the beginning of a slot canyon. The beauty and wonder of the canyon hit us immediately upon entering. 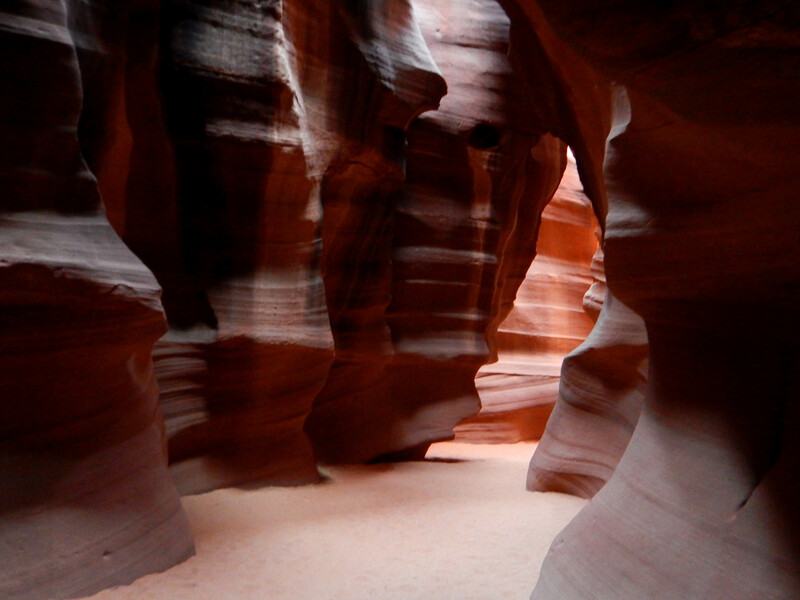 The canyon is only accessible with Navajo guides, as this is a spiritual place for them. Our guide explained that there were seven companies that gave tours (all Navajo) and that 14 million people have visited the canyon. At $35 per visitor, it is good to know that the Navajo nation is able to make some money on this natural wonder. 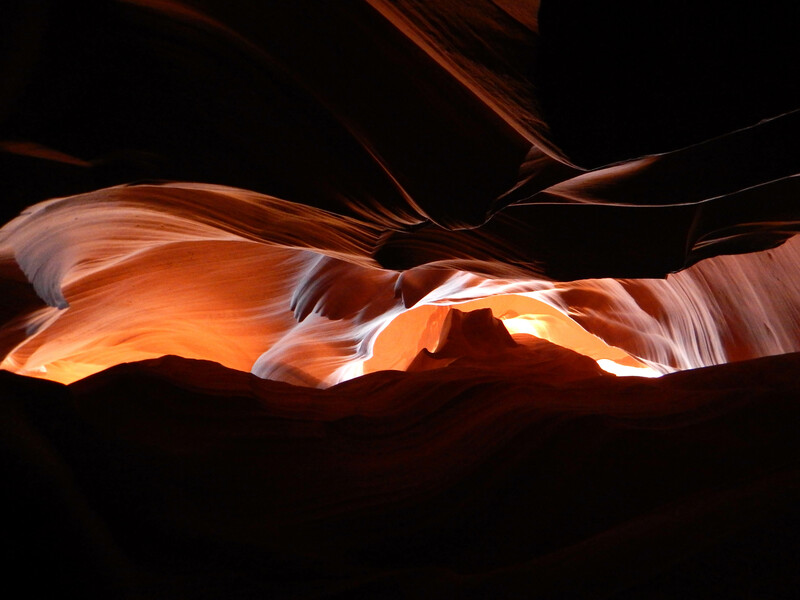 The thing about this slot canyon, which is one-quarter mile long, 125 feet deep, and ranges from three to 25 feet wide, is that the light within is constantly changing. Depending on the time of day, the season, and whether there are any clouds high above, the colors and stripes and textures upon the walls are always distinctively different. 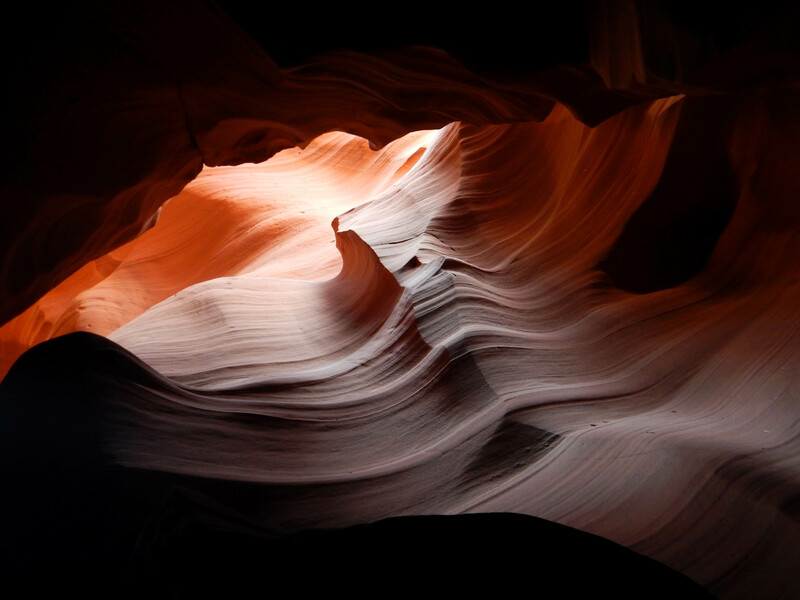 Our guide pointed out the images of several sacred animals, objects, and places as we passed through the canyon, such as eagles, grizzly bears, Monument Valley, and the sun. I tended to linger behind, going at my own pace, separating myself from the group, and thus missed most of what he pointed out. We emerged on the other end of the canyon and, as we traveled back through, I took many more photos as it really did look different with the passing of the time. 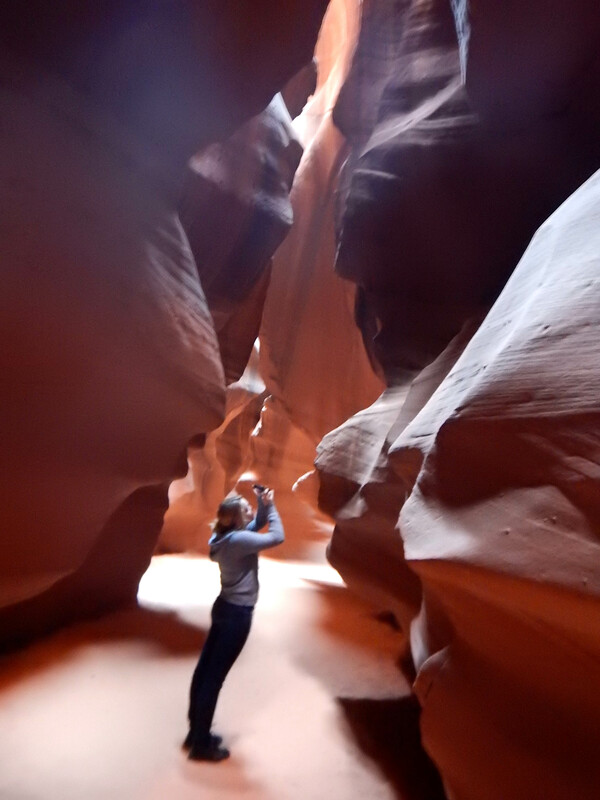 Like many places out West, Antelope Canyon is remote and takes some time to get to, but it was definitely worth it. Beautiful for sure. I’m glad you were able to make the trip there. First of many fun spots, Bill. And the only one I’ve had time to write about so far. I’m putting this on my list! Thank you for sharing. That’s awesome! 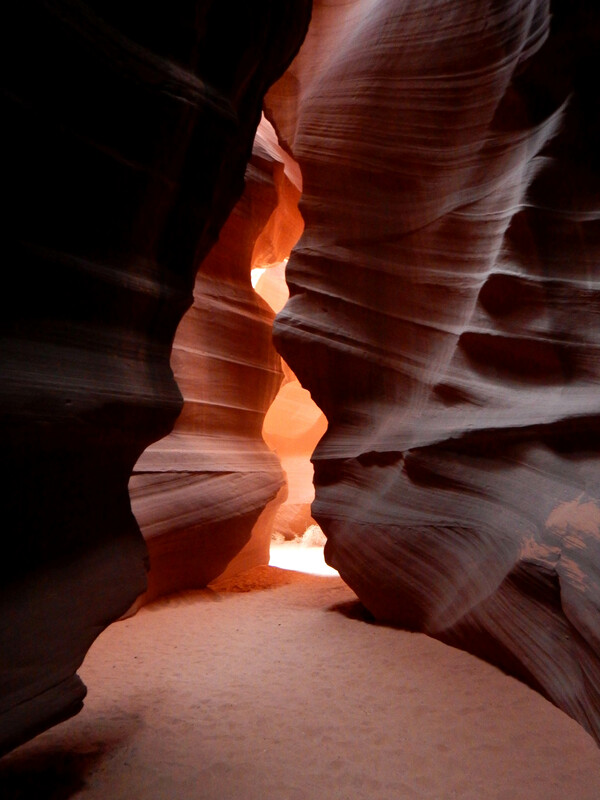 I’ve heard of Antelope Canyon, but I had no idea it was only accessible with guides. What an amazing experience! That’s what they say – that you need a guide. But I don’t see how they keep others out. I would assume that anyone could drive their 4WD down that wash and go into the canyon. Perhaps you’d just risk a ticket? I don’t know, but like you said, I think the trip out with a guide would be quite a fun adventure in itself! Easier, too. Hope you can go some day. Sounds fantastic. I imagine your daughter was able to tick several things of her wonderful bucket list that day, and I’m sure you’ll all remember it for decades to come. We will indeed. Lots of great adventures this trip. Hope to write about them all soon. Amazing, isn’t it? I have seen so many awesome things this trip. Was down your way. First time to Sedona and Slide Rock State Park. 10 years in AZ and I still haven’t made it to either of those places. Maybe this year! That’s how it goes, huh? LOL. It IS! I want to make it to the Four Corners, too. Sounds like a wonderful experience, thanks for sharing the amazing pics. You bet! And thank you for appreciating them. Glad you liked them ! And isn’t that the truth about all the amazing places we have around us? I can’t imagine life without this constant drive to explore the great West. Those pictures are “framable” for sure! That’s how my townhome (was) decorated, love it! It’s a truly magical place, mostly because the average joe can come away with such amazing pictures. They have a “photography tour” where they take you at the best times and help you shoot sun shafts and sand that is pouring down from the top. I’ve seen some of those shots. Truly amazing! Thanks for reading, Linnea. Great photos! 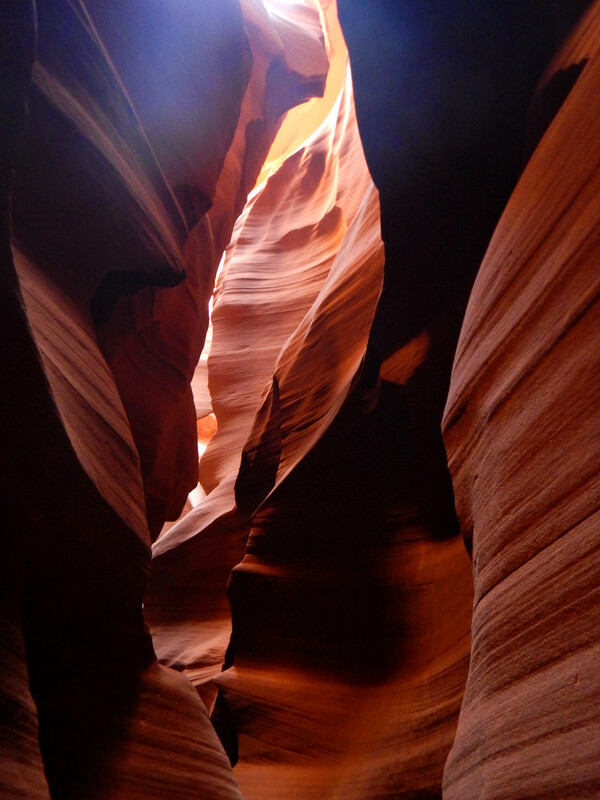 I’ve been to some of the slot canyons in Grande Escalante NM (http://jaspasjourney.wordpress.com/2012/11/08/scenic-byways-slot-canyons-southwest-usa-2012-days-8-9/), and would love to see Antelope Canyon one day. Thanks for the 411! Did you use iPhone camera to capture your posted photos? Also was this the upper Antelope or Lower Antelope you visited?